The sample preparation method depends on the needs in the analysis to be done. For this reason it is important to select the correct preparation method for the analysis in question. 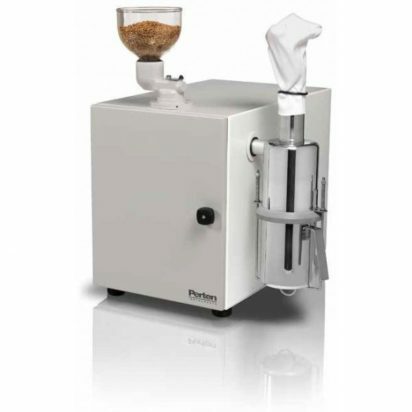 Perten Instruments can offer two types of Laboratory Mills, the hammer mill and the disc mill. Disc mills are mostly only used when grinding samples for moisture determination, whereas hammer mills are used for almost all other applications, such as Falling Number, Glutomatic and NIR analysis for example. We hope that you will be able to find a model that suits your needs, and recommend that you use the “Model selection guide”. Don’t hesitate to contact Perten Instruments or your local representative to discuss your needs. LM 3100 is a hammer mill with a tough metal construction built in and insulated for decreased noise level. It is suitable for grinding for Falling Number, Glutomatic, Kjeldahl and NIR analysis. It has a cyclone sample outlet for easy sample collection, which also makes the mill essentially self-cleaning. This is a simpler hammer mill with a durable metal construction. The sample is collected in a nylon bag. It is suitable for many of the same applications as the LM 3100.
is a disc mill designed for grain moisture analysis and is approved for both oven and NIR moisture tests. It is also adopted by AACC, standard methods No. 55-30 to determine wheat hardness by PSI (Particle Size Index). It can grind samples up to 50 grams in size. is a large disc mill also approved for oven and NIR moisture tests. It is also well suited for grinding larger size material such as feed raw material, pellets etc. 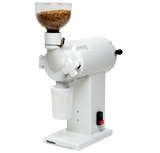 The LM 3600 can grind larger samples than the LM 3303. A motor driven rubber paddle Mill Feeder may be added in order to provide a more consistent feed rate. This improves high moisture grain grinding and grinding grain with the hull remaining, e.g. barley, oats and rice. The constant feed rate also improves overall mill performance and reduces motor strain caused by overfeeding of sample. Model Selection Guide – Redirects you to Perten Instruments website to step through the selection process. The hammer mills grind by means of a high speed rotating steel “hammer” and has a sieve in the periphery through which the sample leaves the grinding chamber. By selecting different sieves the particle size distribution in the sample can be selected. 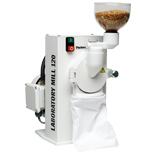 The hammer mill is typically used to produce a smooth, consistent sample. Perten Instruments hammer mills can grind up to 300 gram samples which is the requested amount in the Falling Number test. Due to of the heat development in the grinding operation and the high air flow through the grinding chamber, this type of mill is not suited for grain moisture calculation. The disc mills grind the sample between a non moving disc and a rotating metal disc with ‘teeth’. The main application for the disc mills is grain moisture determination as grain can be grinded this way without moisture loss. The particle size from the mill can be changed by varying the distance between the stationary and the rotating disc. Additionally there are different disc types that can be chosen. Falling Number and Gluten Index – Officially approved mills for Falling Number and Gluten Index sample preparation. High sample homogeneity – Improves repeatability and accuracy of analytical results. Robust design – Excellent durability and very low cost of ownership. Suitable for grains, oilseeds and more – Flexible mills for grinding of many different sample types.